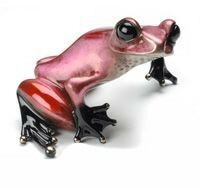 Tickle, rare Frogman Bronze by artist Tim Cotterill. A stunning edition variation of Gem in a silver nitrate pink patina. Rare Limited Edition Solid Bronze Sculpture. Size 2.25" x 3.5" x 3"